49 Massachusetts Avenue is located on the west side of Massachusetts Avenue, between Marlborough and Commonwealth, with 47 Massachusetts to the north and 51 Massachusetts Avenue to the south. 49 Marlborough was designed by architect Samuel D. Kelley and built in 1889 by Warren Dexter Vinal, a builder and real estate developer, one of four contiguous houses (424 Marlborough and 47-49-51 Massachusetts Avenue). 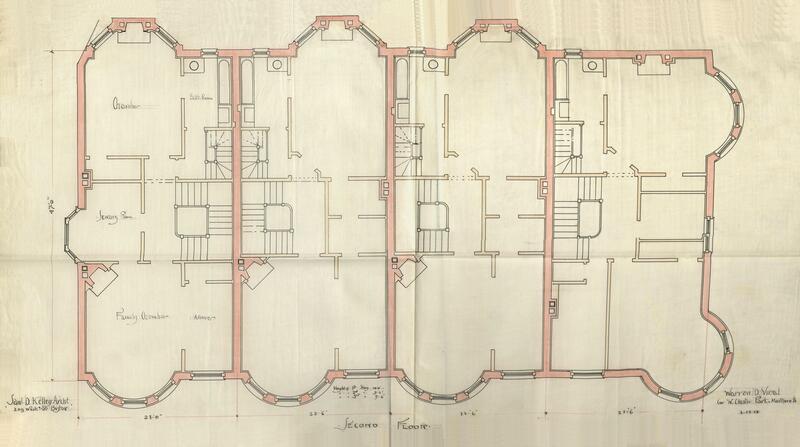 He is shown as the owner on the original building permit applications, all dated March 1, 1889, and on the final building inspection report for 51 Massachusetts Avenue, dated November 15, 1889. On the application for 49 Massachusetts Avenue, the address is shown as 442 West Chester Park; it changed to 49 Massachusetts Avenue when West Chester Park was renamed on March 1, 1894. Click here for an index to the deeds for 49 Massachusetts Avenue, and click here for further information on the land west of Massachusetts Avenue between the south side of Beacon and the north side of Commonwealth. On March 31, 1890, 49 Massachusetts Avenue was purchased from Warren Vinal by Thomas Niles, Jr.
Thomas Niles, Jr., was a publisher in partnership with Lewis A. Roberts in the firm of Roberts Brothers (Thomas Niles, Jr., was the half-brother of Lewis Roberts’s first wife, Alice (Niles) Roberts) and is credited with suggesting to Louisa May Alcott that she write a “write a girls’ book” for his firm, the resulting work being Little Women. A bachelor, he lived at 110 Beacon with his cousins, Emily Hale Niles, Anna Hale Niles, and Sarah Fowle Niles, the daughters of his uncle, William Jenkins Niles and his wife, Mary Ann (Hale) Niles. On April 14, 1890, he transferred a one-half interest in 49 Massachusetts Avenue to his three cousins. By the 1890-1891 winter season, 49 Massachusetts Avenue was the home of Alice (Spring) Blake, the widow of banker James Henry Blake, and their son, Henry Spring Blake. They previously had lived at 193 Beacon, where James Blake had died in November of 1889. Thomas Niles, Jr., had purchased 193 Beacon from Alice Blake in February of 1890, and it appears likely that his purchase of 49 Massachusetts Avenue and subsequent lease of it to Alice Blake was part of the consideration for 193 Beacon. Thomas Niles, Jr., died in May of 1894 while traveling in Europe with Emily, Anna, and Sarah Niles. In his will, he left the bulk of his estate to them, and left smaller amounts or nothing at all to his siblings. After a highly-publicized legal challenge, the will was sustained by the courts. The Niles sisters continued to live at 110 Beacon. Emily Niles died in September of 1908, leaving her property to her two surviving sisters, and Anna Niles died in June of 1911, leaving her property to her sister, Sarah. On April 12, 1923, 49 Massachusetts Avenue was acquired from Sarah Niles by Thomas E. Dempsey. Alice Blake continued to live at 49 Massachusetts Avenue until her death in June of 1923. Henry Blake, a stockbroker, moved to the Hotel Somerset and, in July of 1923, married to Mrs. Lucie (Mitchell) Seeley Lawson, the former wife of Herbert Barnum Seeley and of Arnold Lawson. After their marriage, they lived in an apartment at 481 Beacon. On November 24, 1923, 49 Massachusetts Avenue was acquired from Thomas Dempsey by Constantinos A. Chironis and D. James Coules. On April 15, 1924, 49 Marlborough was acquired from Constantinos Chironis and D. James Coules by real estate dealer William N. Ambler, and on April 23, 1924, he conveyed the property to real estate dealer Edward J. Ball. In February of 1924, Edward Ball had acquired 47 Massachusetts Avenue, also through William Ambler. From this point, both buildings were owned by a single owner. In July of 1924, Edward Ball applied for (and subsequently received) permission to install a new storefront at 47 Massachusetts Avenue. At about the same time, he also converted 49 Massachusetts Avenue into a store and multiple dwelling. Napoleon Demara and his wife, Anna Teresa (Connors) Demara, lived in Lawrence, where he was a theatre owner. As of 1930, the City Directory listed four storefronts at 47-49 Marlborough: Julius Polansky, a tailor (47A); the Economy Grocery Store (47B); Emma Brothers (Joseph and Gaetano Emma) shoe repair (49A); and the Baschi Studio of voice culture (49B), operated by Alice Baschi, who also lived at 49 Massachusetts Avenue. A “Chinese Laundry” also was listed at 49 Massachusetts. By 1938, Julius Polansky, tailor, (47A) remained, but the Commonwealth Food Shop, operated by Maurice M. Schwartz, had replaced the Economy Grocery Store at 47B Massachusetts Avenue. It remained there until about 1945, when it moved to 51 Massachusetts Avenue. Emma Brothers shoe repair (49A) remained, but the Baschi Studio at 47B Massachusetts Avenue had been replaced by a massage studio operated by George Rice and Lillian C. Dixon. She lived at 49 Massachusetts Avenue with her husband, John J. Dixon. The directory also continued to list a “Chinese laundry” at 49 Massachusetts Avenue. On September 27, 1940, the Essex Realty Trust foreclosed on a mortgage given by Napoleon Demara and transferred 47-49 Massachusetts Avenue to Levena L. Broyderick of Lynn, bookkeeper in a law office. On June 18, 1941, the Home Savings Bank foreclosed on the first mortgage given by Napoleon Demara and took possession of 47-49 Massachusetts Avenue. On September 20, 1941, 47-49 Massachusetts Avenue were acquired from the Home Savings Bank by Patrick Curtis, and on September 26, 1941, he conveyed the property to Salvatore Hakim, trustee of the Harmo Realty Trust. On January 20, 1943, 47-49 Massachusetts Avenue were acquired from Salvatore Hakim by real estate dealer Harold Rustin, trustee of the Belmont Realty Trust. On July 26, 1943, he transferred the property to his wife, Rose (Lewitzky) Rustin. They lived at 538 Newbury. 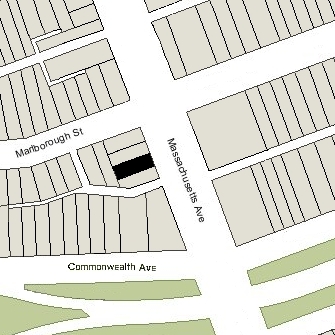 On October 1, 1945, 47-49 Massachusetts Avenue was acquired from Rose Rustin by Sarah M. (Sulkin) Toy Meshon, the wife of Barney Meshon (Busie Misoniuk). They lived in Brookline. On October 23, 1945, Sarah Meshon transferred a one-half interest in 47-49 Massachusetts Avenue to Celia (Gorman) Bernstein, the wife of Barney Bernstein, and on April 3, 1946, Sarah Meshon transferred her remaining one-half interest to her. On January 27, 1962, Celia Bernstein transferred a one-half interest in the property to her daughter-in-law, Evelyn (Peggy) (Pearlman) Bernstein, the wife of Morris Bernstein, a lawyer. Morris and Evelyn Bernstein lived in Newton. On August 14, 1972, Celia Bernstein transferred her remaining one-half interest in 47-49 Massachusetts Avenue to Evelyn Bernstein and her other daughter-in-law, Sara (Swartz) Bernstein, the wife of Dr. Harry B. Bernstein, a physician. Harry and Sara Bernstein lived in Belmont. On October 6, 1977, 47-49 Massachusetts Avenue was purchased from Evelyn Bernstein and Sara Bernstein by Despina (Kalogeras) Mourlas, as trustee of the Despina Realty Trust. The beneficiaries of the trust were her three children: Constantine Mourlas, Alexander (Spiros) Mourlas, and Anthony (Antonios) Mourlas. 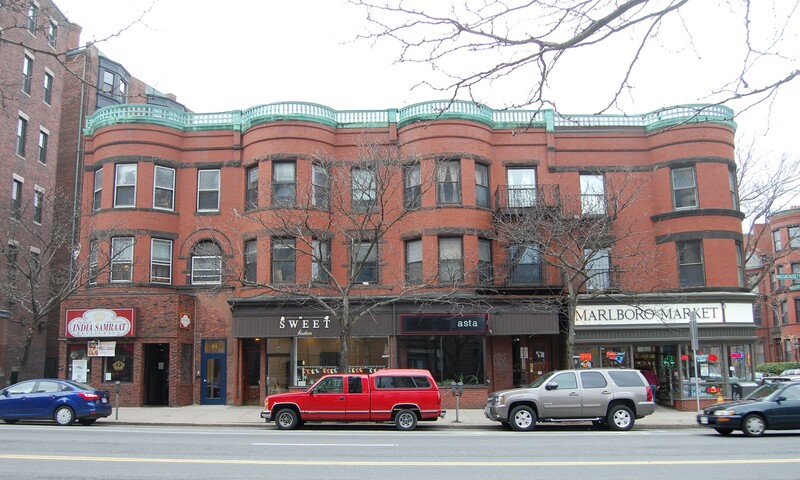 In March of 1978, Despina Mourlas filed for permission to consolidate 47 and 49 Massachusetts Avenue into one property, with the combined occupancy of six apartments, a retail store, and restaurant. She subsequently abandoned her application. Despina Moulas operated a pizza restaurant, Despina’s, at 47 Massachusetts Avenue. She married again, in the mid-1980s, to George S. Tzantzos. On November 14, 1987, she transferred the property to herself as trustee of a newly organized Despina Real Estate Trust, of which she was the sole beneficiary. She continued to operate Despina’s Pizza until 2008. Despina Tzantzos died in December of 2013. On April 23, 2015, 47-49 Massachusetts Avenue were purchased from Despina Tzantzos’s estate by the 47-49 Massachusetts LLC (Ty Gupta, manager). 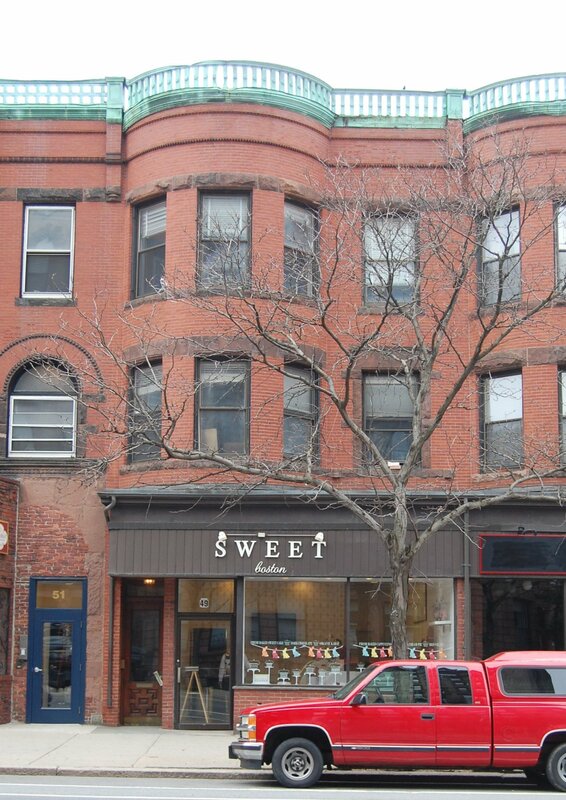 On June 27, 2018, 47-49 Massachusetts Avenue were purchased from the 47-49 Massachusetts LLC by Tao Cai of Cambridge. On August 2, 2018, he transferred the property to himself as trustee of the Massachusetts Avenue Realty Trust. 47-49 Marlborough remained a residential and commercial building, with six apartments and two storefronts, in 2018.